We are proud to present the M215 M-LOK 15″ of our M215 small arms family. This rifle is chambered for the popular and easy to acquire 5.56×45 NATO cartridge! The ML15 rifle has a 15″ M-LOK handguard that is slim line and free floated. It helps to reduce overall weight and aids comfort in handling the rifle. Similar to the M215 Low Profile rifle, the M215-ML15 rifle is equipped with a standard flat top receiver with MIL-STD-1913 rail to accept all your optics choices. 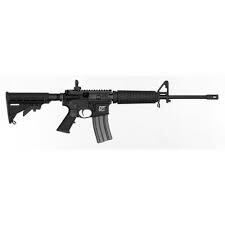 These rifles are equipped with an M4 Profile barrel that has a 1:8 twist rate. This intermediate twist rate does an excellent job of stabilizing the different weight projectiles on the market for excellent accuracy results out of our rifles.